I apologize for the lateness of today's post and appreciate those of you who have visited already this morning ... leaving lovely birthday wishes on Sunday's offering. Thank you! 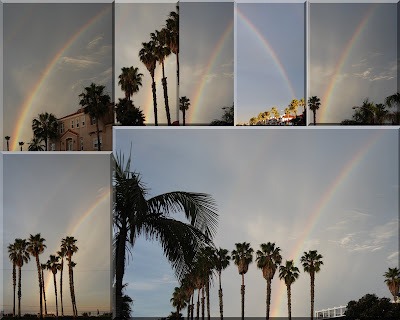 so I grabbed my camera and headed for the beach to capture unobstructed views of this glorious rainbow and here are a few of the photographs collaged with PSE6 in two versions because I can't decide which I like best. This feels like a MARVELOUS GIFT today ... as do the blossoms in my front yard. I snapped a few more images and will share them in the days to come, rather than trying to do it now making it even later. For those who might have missed them over the weekend, I did share glimpses of Spring in Friday's post for Today's Flowers with a bit of Haiku. Grilled Shrimp & Guacamole Tostada Bites - Tostada rounds topped with fresh hand-hacked guacamole, a dash of chipotle and cilantro pesto marinated grilled shrimp. Ancho Fudge Pie - Our famous fudge pie with walnuts, pecans and a pinch of ancho chile to bring out the rich chocolate flavor. Served warm with whipped cream. Each day brings new things to discover & learn ... opportunities to share with others in a myriad of ways ... moments to savor with delight ... challenges to meet with excitement & creative energy. I believe LIFE is an adventure ... that unlimited possibilities abound & meaning is generated when we follow our dreams ... giving generously while receiving with gratitude. I received this lovely cake in email from Blingee this morning. It certainly LOOKS tasty & festive so feel free to have a slice while you visit if you wish. 24 at BlogRolls, Bling & Blurbs ... and 62 at Happily Retired Gal for a Grand Total of 927!!! Who knew I'd be so prolific ... certainly not me! As my gift to all who visit ... please accept this Rainbow Award to enjoy yourselves & pass it along to others who practice gratitude in their lives on a daily basis. Hpppy bitrhday to you my friend,and here's to many more graceful days. Happy, HAPPY, Birthday friend! I hope you have a wonderful day! What a fun Thought for the Day--I'll try to remember that one! Have a lovely day. Happy, Happy Birthday to You. 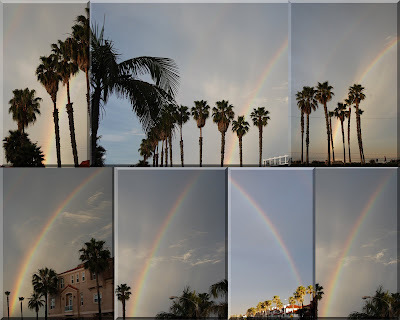 What great rainbow photos and what a great present for your birthday. Much love to you and yours for today and the year to come. Happy Birthday, dear Virginia! I'm thankful for the beautiful skies on your birthday, and the opportunity you have to celebrate with your sister. Thank you for sharing the lovely Rainbow Award. The quote makes me laugh! I have an award for you on my site! I hope that you are having a great day! Happy Birthday! With a rainbow like that it must have been a wonderful birthday. Which did you choose -- the fudge pie or the cobbler? That would be a very difficult choice for me to make! Happy belated birthday HR Gal and many more to come. You are a gift to us all with your happy upbeat outlook. Happy belated birthday! I forgot to come back and check. . . YOU certainly received a rainbow blessing for your birthday!!!!!!!!!! For a beautiful birthday inheaven. Loved your birthdya surprise and thanks for sharing it with us by way of photos. Hope your dinner out nite was scrumptious! Hope your b-day was wonderful! Happy Birthday! I love the photo collages. We lived in Huntington Beach before we moved to Big Bear and I really miss the ocean. It's nice to "virtually" visit the beach through your beautiful photos. A very happy birthday belatedly. What a wonderful way to start your day. You really got some beautiful views there. Regarding the age thing, I try not to think of my age according to the calendar, it's how you feel in your head and heart. Happy belated birthday! Gorgeous rainbow pictures! I haven't been around much either with working on the house so I understand how quickly we fall behind. Oh no, I missed your big day on the day! Happy Belated Birthday!!!!! You amaze me with your zest for learning and generosity of spirit. Maybe I can make it up to you by singing The Beatles - "When I'm 64...." Have a most wonderful new year! Love and Hugs, kara a.k.a in a former blogging life spiritdoll. I don't think it's quite fair that you have all that fabulous weather, flowers AND rainbows!! Beautiful day for a birthday! 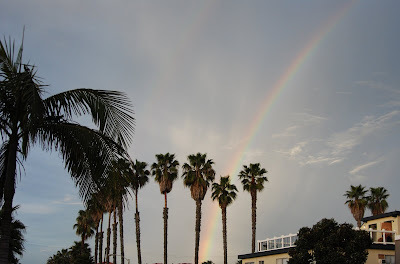 Your photos of the rainbow are awesome. I enjoyed seeing the palm trees, which of course is something we don't have here in Ontario. Drop by when you can. I'm having a book giveaway. Just look at that beautiful rainbow collage!!! Wow...so, so wonderful. I'm late in getting around to visiting a lot of my blogging buddies. We have been outdoors because the weather has been just terrific. Not much online time at all unless really early in the morning...when it's still dark before sunrise. I am here to wish you a very belated birthday wish....hope it was a happy one!!! Blackened salmon and tuna, grilled cilantro pesto shrimp, wild mushrooms and baby spinach, topped with Jack and cotija cheeses and a roasted red pepper sauce, served with green chile rice and black beans." I hope you had a lovely birthday! What beautiful shots and images on such a special day. I'm doing my monthly catch-up-on-blog-reading thing and wanted to wish you a (very) belated happy birthday! I'm glad the world gave you such a lovely present.